Mahmoud Sarsak, a PA Arab soccer player who staged a hunger strike while in an Israeli jail, freed and returned to Gaza. Mahmoud Sarsak, a Palestinian Authority Arab soccer player who staged a hunger strike of nearly three months while in an Israeli jail, was freed on Tuesday and returned to Gaza. AFP reported that the 25-year-old entered Gaza in a Red Cross ambulance to be greeted by hundreds of people, including relatives, who waved PLO flags and pictures of other prisoners. The report noted that Sarsak was taken to Gaza City's Shifa hospital, which said he was weak but in good condition. 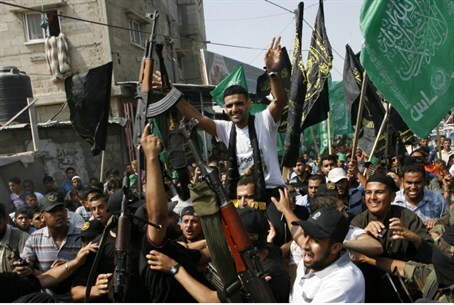 He then returned to his home in Rafah for a celebration in his honor. Sarsak, 25, began refusing food in late March. He continued his hunger strike even after the end of the mass hunger strike by thousands of Arab prisoners. He did take vitamins and sugar and drank milk during the strike. His detention order was due to expire or be renewed on August 22. On June 18, Sarsak, who was imprisoned by Israel in 2009 on suspicion of terror activities, agreed to end the hunger strike in exchange for his release. As his condition deteriorated, prominent figures in the sports world came to his support. The Palestine Football Association (PFA) asked UEFA to bar Israel from hosting the 2013 European Under-21 Championship because of the detention of Sarsak and two other PA Arab players. UEFA, however, confirmed that Israel will host the championship, despite the mounting pressure following the detainment of the three players. AFP reported that Amnesty International expressed “relief” over Sarsak’s release, while calling on Israel to "immediately end the use of administrative detention, and release all Palestinians held under any legal provisions allowing its use, or charge and try them fairly in a court of law consistent with international standards."